I have shorted the US Dollar Index at 83.005. I have shorted the June contract of the USDX. I shorted it at around 16:31 my time. As always, I have entered a protective stop-loss order to limit my exposure to potential losses. We have seen seen the USDX rise steadily for about a month-and-a-half now. Prices found support at 79.00 and are currently in the 83.00 area. We haven't seen any serious corrections during that time, which was my first clue to start taking a closer look. After examining the daily chart for the dollar index, I noticed the waning momentum in the MACD indicator. Although the moving averages have not diverged, the MACD histogram divergence is clear. In my past experience, this is enough to warrant a serious trade consideration. The next thing that convinced me to enter a short position in this market, at this point in time, was last weeks price action. Looking at the last 3 bars, we observe large swings up and down. Specifically, we see a large swing up making a new high, then an almost complete return swing down, then another larger swing up clearing a new high. Each of the swings was over 0.50 with the last one being nearly 1.00 points. This type of wild, indecisive, erratic action at relatively high prices, and with an MACD divergence present, combined to tilt me over the edge into a selling posture. Observe the daily chart for June dollar index futures trading. 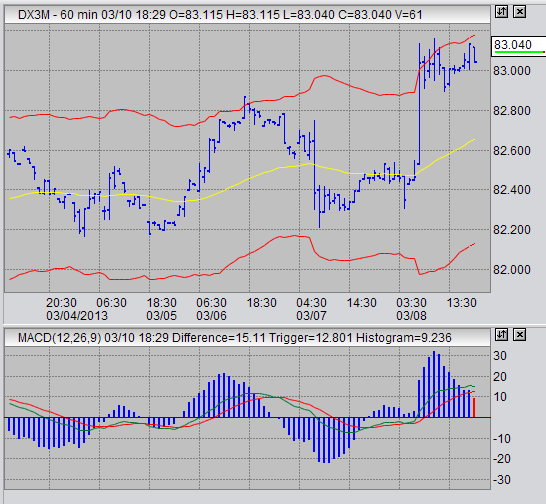 Observe the hourly futures trading chart for the June USDX contract. There really isn't much to see here in the hourly chart, in terms of specific signals and stuff. Mostly, its just a close up of the wide swings we've seen in the last week. Having already decided to enter on the daily charts, I am really just looking for an "upper-area" of sideways price action to enter. Using that logic, I have placed my stop fairly wide, as I would not be surprised to see another sudden spike in prices. Should that occur, I will watch closely and decided whether or not to remain in the trade or exit manually and cancel my stop. Over the last few weeks, we have seen crude oil prices decline by nearly $10. I have already managed a profitable trade in this market. I feel there is still a little bit more juice to squeeze here. Late last week, I entered a new short position in the low 92's. I'm looking for an exit around 90. The main drop in prices may, or may not, be over. However, I feel there is still some lower prices to be had as oil tries to consolidate a bottom or makes new price lows. I will post updates in the futures trading blog regarding the crude oil trade and the US dollar index trade.